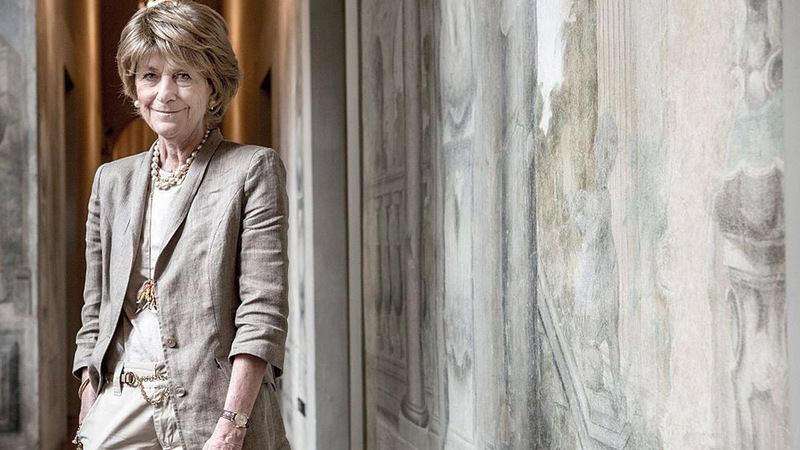 Mrs. Giovanna Gentile Ferragamo started working for her father's namesake brand at the age of 15. While a thoroughly Italian brand, the house of Ferragamo has more than a bit of the American Dream in its backstory. Salvatore Ferragamo was an Italian drawn to sunny California and made his mark with starlets (Marilyn Monroe was a muse) and the "Hollywood Boot Shop" in 1923 before returning back to set up shop in Florence. The story of a humble cobbler dedicated to his craft is familiar to fashion-lovers, yet less is heard about the strong, effortlessly elegant women who helped build the brand into what it is today. 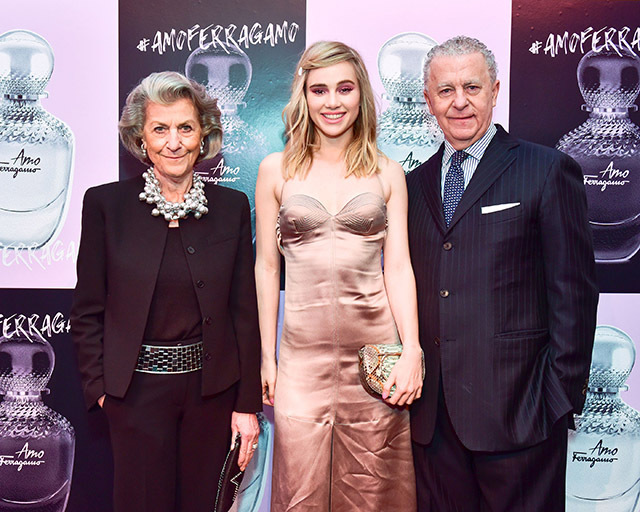 And that—a thriving label that just celebrated the launch of its latest fragrance, Amo Ferragamo—wouldn't have been possible without Salvatore's second-eldest daughter, Mrs. Giovanna Gentile Ferragamo. 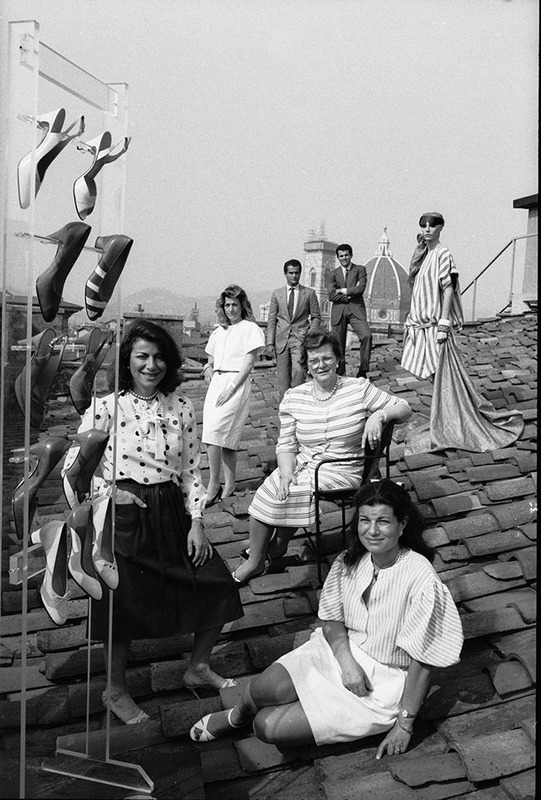 The Ferragamo clan from left to right: Fiamma, Giovanna, Leonardo, Wanda, Ferruccio, and Fulvia. A model is on far right. She joined the family firm as a teenager, following in her older sister's footsteps and diving into ready-to-wear. She is currently a vice president within the company. "My father wanted [Fiamma] there so he would feel a continuity in his work. I started when I was 15. I was still attending school and only working the hours when I was free from school, so I was in and out," says Giovanna. On the patriarch welcoming his girls into the family business, she adds, "That's what he had, you know? I'm sure if it was boys he would have been happier, but they only came after the third pregnancy. Because he lived in the States for many years he really was very open-minded compared to other Italians who might have been more resistant to women doing things." Below, her memories of working with family, staging her first fashion show, and arriving in New York Harbor at dawn aboard an ocean liner. "Working with sisters is wonderful. I consider my sisters my best friends. [My oldest sister] Fiamma and I grew up together like twin sisters. We had very different characters, but sometimes it works better that way—if you have similar characters, you may fight. The third sister is much younger than me. I married very young and she was still small, so I didn't spend as much time in the house with her as I did with Fiamma. But when you reach a certain age, you're adults together, and you don't even count the number of years. It doesn't make a difference." "It was into New York and I arrived on boat, the Christopher Columbus. That is a picture I will never, never forget. We arrived very early in the morning so the light was a little dusky because of the sun coming out. The boat was very slow, approaching little by little, so you see from a distance at first. [Manhattan] looked as if it was a ghost town with all these skyscrapers and the skyline; the Statue of Liberty appeared little by little. I thought I could faint right there, it was so beautiful." "Whenever we meet in the family, even these days, we don't talk business. We don't take home what we have in the office, it's just a family, and this has really been our strength. My mother [Wanda] was fantastic at this because she tried hard and intently to make sure there were no questions between us. Even when we had to make important decisions, she would never confirm it if it was not unanimous. This is why we've perhaps grown a little more slowly compared to others—it slows you down a little bit. But sometimes that's very positive because you have more time to think things over. "My mother was wonderful. There was a large age difference between my father and my mother. He adored her, spoiled her. But because of that, he kept her like a jewel. He always told good stories, good things happening at work, never the more difficult ones. But when my father died [in 1960], she had never worked before. She knew a lot about the business and was so proud of what he'd done; they had a very intimate connection, and it must have been awful, to find herself alone. My youngest brother, Massimo, was only two years old when my father died. After thinking what to do, she decided she would try and go on. She did with such determination, intuition, and capacity that no one would believe she hadn't been trained for it." "I did realize it was something a little bigger than I. The collection was small because I was still in school, producing in the spare time I had with a young dressmaker who was coming in. I had a little space next to my father's office and was buying discount fabrics, just enough to make one piece. I had put together like 15 or 18 pieces, very much sportswear which you could coordinate, but weren't a total look. My father was there, and it was very much his idea—I didn't look for that, but I had such fun. 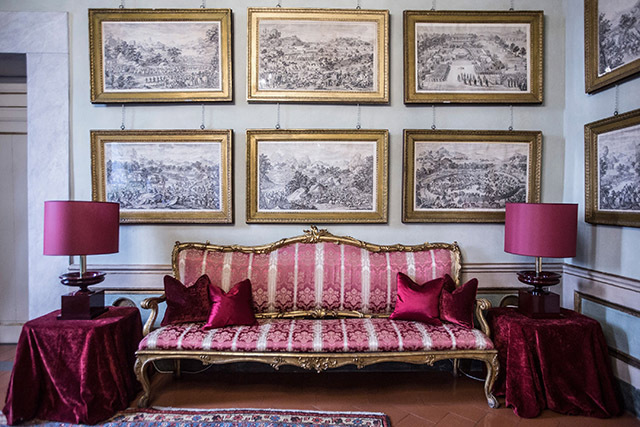 "I was once called by my father into his big showroom in the Palazzo Spini Feroni and there was a buyer from Lord & Taylor and he wanted me to show the collection to him. I could have gone under the table, because I didn't feel ready. I showed the collection—it was summer, which I was more proud of—and he liked it, made an order, and that's how I started more seriously. 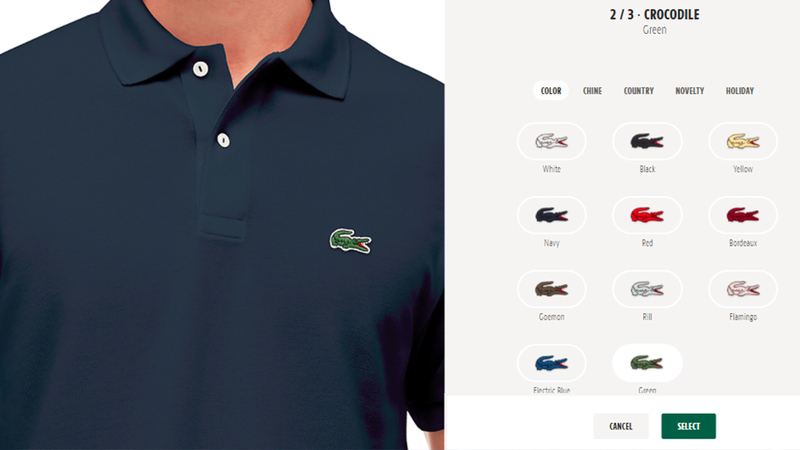 Once you get the order you have to produce six pieces all of the same thing, four of another." "It used to be very different, years ago, because life here was different. They were different ways to approach style. I remember the first time my mother took me to lunch at The Palm Court at the The Plaza, and in those days that was really the place where beautiful ladies were getting together to have a bite, to chat about things, and to show their handbags, their shoes, how good they were looking. I was amazed, with my eyes out of my head. That side in Italy was not so evolved. "Italian style is much more a DNA of the people, of the country. I think it's important for every country to keep and build its own style. These days you see it less and less because of globalization and the way you get information in an instant. You lose a little bit of it, which is a shame." The best way to travel is "anything that keeps you in contact with nature. Now you jump into an airplane, and from the center of one city you go immediately into another one and you don't even know what's in between. Trains are very nice because you can look at the landscape. I go to China quite often, and I always take three or four extra days to visit places outside the big cities. I go by car and train and it's fantastic, because you see people, landscape, cultivations. These days it's like a competition which city and has the highest and most beautiful skyscrapers, but there's so much life and territory you can appreciate. Many times you can find the answer to things if you know where people come from." "There is the philosophy that you have to move on the same wave, but look forward, not be anchored to the past, not forget the roots you have. Like a plant: Grow from your roots. We also develop and change, in the years and the centuries, but the roots are there."